We’re Regional: HCA is written for High Country fishermen, by High Country fishermen, about high country fishing. If you want to reach high country anglers, this is the place to do it. 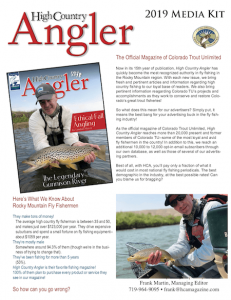 And as the official magazine of Colorado Trout Unlimited, we carry content that is fresh and relevant to every angler in the region. Better Content: While most national magazines must appeal to a broad range of fishermen, we address issues that are relevant to anglers in the Rocky Mountain Region. Targeted Distribution: While national magazines may have a broader distribution, HCA targets your advertising dollar to one of the nation’s largest fly-fishing bases–fly fishermen in the Rocky Mountain area. HCA is emailed directly to over 20,000 members–and former members–of Colorado Trout Unlimited, which gets us into the hands of the “gatekeepers” of the high country fly fishing industry. We also maintain our own email list, and so do a number of our advertisers, and many of them also distribute HCA to their customer base, giving us an opt-in email distribution of tens of thousands additional copies! 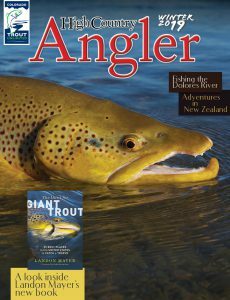 This multi-tiered method of email distribution makes us one of the most widely distributed fly fishing magazines in the industry! We’re Quarterly: Unlike monthly or semi-monthly magazines, HCA publishes quarterly, giving your ad longer exposure time in front of a broader customer base. We’re Cheaper: A targeted, online distribution means cheaper ad prices for you. Compare our rates against any other fly-fishing magazine and you’ll see how HCA gives you the biggest bang for your advertising buck. We Support TU: No one works harder for fly-fishing than Trout Unlimited, and by advertising in HCA, you’re helping one of TU’s largest national chapters–Colorado Trout Unlimited–get the word out about their many conservation programs and needs. We Work Harder: We bend over backwards to see that your ad reaches your customers wherever they happen to be. When you talk, we listen! So why waste money on ads that seem to reach everyone BUT your customers? Contact your HCA Sales Rep Today!